Barrie, Ont. 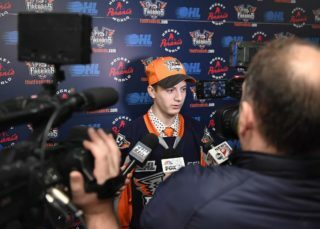 – Jake Durham, Ethan Keppen, Cody Morgan and Evan Vierling each recorded two-point games and Emanuel Vella made 37 saves in a 4-3 road victory in front of 3,450 fans at the Barrie Molson Centre Saturday. With the win, Flint earned three out of a possible six points on the weekend road trip. Keppen now has points in 16 of his last 17 games, Wismer has 21 points in his past 21 games and Morgan has 16 points in the last 14 games. Jack Wismer started the scoring for the Firebirds just 57 seconds into the opening frame. Cody Morgan retrieved a loose puck behind the Colts’ net and centered it to Wismer in front who one-timed it past Jet Greaves. Ethan Keppen picked up the second assist. Then, Evan Vierling intercepted a pass in the neutral zone and dished it off to Jake Durham for a breakaway who scored farside, blockerside at 8:29 of the first period. The Firebirds led 2-0 after the first 20 minutes and outshot Barrie 15-7 in the opening frame. Flint would increase their lead to three when Hunter Holmes recorded his eighth of the season at 1:18 of the middle period. While on the power-play, Evan Vierling sent a pass from the left circle to Jake Durham at the far wall. Durham rifled the puck on net that Greaves made the initial save on but Holmes fired the rebound into the back of the net from the slot. At 8:10, Keppen scored his 24th of the season and found the back of the net for the fifth consecutive game. From the top of the slot, Cody Morgan found Barrie native Dennis Busby at the right circle. Busby quickly sent a pass to Keppen backdoor who converted on the man-advantage to earn Flint the 4-0 lead. The Firebirds were outshot 19-9 in the second period but were leading 4-0. Then, from the right circle, Hawerchuk connected with Ryan Suzuki at the left circle who toe-dragged the puck around a Firebird and scored blockerside at 12:01 on the power-play. The Colts scored three unanswered in the final period. First, a shot from Ben Hawerchuk deflected off Jason Willms and into the net on the power-play at 2:44. Barrie came within one 43 seconds later. Riley Piercey dished a pass backdoor to Peter Fleming who found twine with 7:16 remaining but the Firebirds held on for the 4-3 victory. The Firebirds were 2-for-4 on the power-play and were 4-for-6 on the penalty kill. 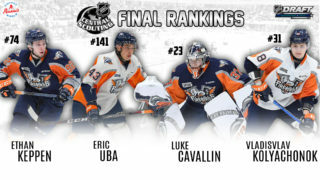 Keppen was awarded first-star honors and Vella was named the game’s second star. 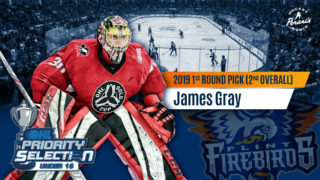 Next up for Flint, the Firebirds will play their final contest against in-state rival Saginaw Spirit this Wednesday, Feb. 13 at the Dow Event Center. Puck drop is set for 7:05 p.m. (ET) in the I-75 Divide Cup contest, sponsored by Coors Light.